Whitehall Personalized Mailbox Address Marker - - two sided address marker generally found on a rural style curbside mailbox as shown above. Made in USA. Holds up to sixteen 1.25" characters (including spaces). Displays your address on both sides. 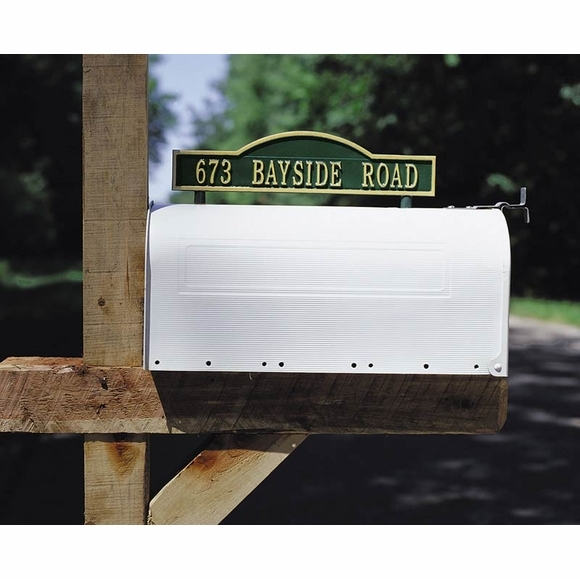 Like all Whitehall personalized address plaques, this mailbox marker is crafted from rust-free recycled aluminum. Available in two different styles: arch and scroll. Choose one of the following color combinations: AB antique brass; AC antique copper; BG black with gold characters; BS black with silver characters; BW black with white characters; GG green with gold characters; OB oil rubbed bronze; OG bronze with gold characters; PS pewter with silver characters; RG red with gold characters; and WG white with gold characters. Attaches to the top of your mailbox with the included hardware: two each threaded studs, cork washers, and wing nuts; and an allen wrench. You will need to drill holes on the top of your mailbox if not already there. Instructions shown in the small images above labeled Figure 2 and Figure 3. It was the finishing touch for the front yard. Made well. Looks great. There are a few things that could be added. 1. Longer studs for larger plastic mailboxes....I had to buy a 2 1/2" & 3" screw for my plastic mailbox. 2. A layout guide for drill holes. (I took a sheet of paper, with the studs in plaque use a marker on bottom of studs, then place on paper to get exactly where the holes should be drilled. Overall, product is worth it. Looking at getting for the family.